Noel’s mourning his godmother Mattie, a former suffragette. Wise beyond his years, raised When Noel Bostock—aged ten, no family—is evacuated from London to escape the Nazi bombardment, he lands in a suburb northwest of the city with Vera Sedge—a thirty-six-year old widow drowning in debts and dependents. Always desperate for money, she’s unscrupulous about how she gets it. To ask other readers questions about Crooked Heart, please sign up. Hard to believe I could find a novel about the London Blitz and WWII both heartwarming and at times ironically humorous. But I did and much of this is due to the author and her wonderful characterizations. I quickly fell in love with ten year old Noel, a precocious boy of unknown origins who was being raised by his suffragette and eccentric godmother, Mattie. Eventually he will be one of the children evacuated and taken in by a woman named Vee, who sees this as an opportunity to make some money. Hard to believe I could find a novel about the London Blitz and WWII both heartwarming and at times ironically humorous. But I did and much of this is due to the author and her wonderful characterizations. I quickly fell in love with ten year old Noel, a precocious boy of unknown origins who was being raised by his suffragette and eccentric godmother, Mattie. Eventually he will be one of the children evacuated and taken in by a woman named Vee, who sees this as an opportunity to make some money. What is wonderful about this novel is how they characters change and grow throughout, some for the better some for the worse. Yes, there are bombs falling, deaths and accidents, thievery and lost people but for the most part, Noel and Vee, their exploits, and their growth, propel this novel. Wonderful story about two people who find each other in an unusual time and in unusual circumstances. 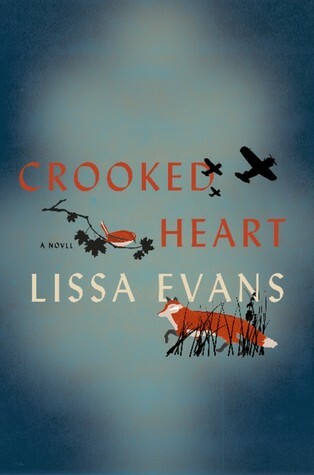 Lissa Evans, an English writer, pens a heart-touching historical fiction, Crooked Heart: A Novel about unusual friendships set against the vivid and honest backdrop in London during the world war II, when Germany was constantly dropping off bombs over the city of London. Together, they cook up a scheme. Crisscrossing the bombed suburbs of London, Vee starts to make a profit and Noel begins to regain his interest in life. But there are plenty of other people making money out of the war—and some of them are dangerous. Noel may have been moved to safety, but he isn’t actually safe at all. Noel, a 10 year old boy's journey begins at Hampstead as an orphan hence living with his cousin god-mother, Mattie, who was a suffragette. But due to her memory loss and the raging war took a toll on her thus turning already orphan Noel into an evacuee who had to leave behind his only relatives in Hampstead to a safer suburb in St. Alban's, where he became a part of the Sedge family consisting of a strong, often ridiculous and always a mean woman when it comes to getting her hands on extra money by hook or crook, Vera and her lazy son, Donald and her sick mother who ocassionaly wrote letters to Winston Churchill in order to participate in the war in some way, Flora. Noel's arrival, who happens to work with a slight limp due to polio, in Vera's life turned out to be a boon as she could ask for money from door-to-door for her numerous charity scum, on the other hand, Noel gradually began to like Vee's mean ways of tricking people into giving money for her charity. Together the pair braces the war-raged city of London from one suburb to another in order to run their charity, but will this war, which also threatens to take away not only the social, economic as well as political well being of a human being but also the heart of a human being, be able to tear apart this unusual yet undying bond of friendship between a woman and an orphan boy? The writing is fantastic layered as well as mixed with deep emotions, which has an ability to tug the readers' heart strings. The narrative is absolutely engaging layered with dark humor and wit with Vee's comical narrative as well as demeanor. The prose is evocative and the author has vividly captured the essence of a particular location through her story. The timeline as well as the backdrop both are strikingly portrayed thus falling in sync with the story of Vee and Noel. London and it's suburbs back during the second world war is carefully and distinctly arrested in to the background thus making the readers feel like they are tele-ported back in time. Each and every street in London during the air raid as well as the resulting chaos are perfectly captured and when these two characters walk through that chaos, it will make the readers feel like they too are challenging the war to find a way to their living. The main characters, especially, Noel and Vee, are drawn with enough realism. Noel's intuitive as well as bibliophilic nature will keep the readers glued to the storyline, whereas Vee's wit will make the readers go LOL at times. The rest of the characters are too strikingly and strongly developed and make their presence felt deeply in the story as some of the supporting characters are etched out with lots of back story, thus providing depth to their demeanor. The theme is war and friendship and how people used to survive or make a living in the war. It is surprising to see that most people used to trick others into giving money to them for some vague and unreal reason and everyone was involved in some kind of illegal business to make some extra cash during the war. Vee had debts of her own and to survive herself and her family from those debts she used Noel, a crippled boy, to become her ally in order to help her collect money from people by lying, and it seems Noel too used to enjoy the way he used to help Vee and gradually in a race against the war to survive and support, these two become not just friends but more than that, which doesn't ask for sympathy from the readers but makes their hearts fill with joy and love. In short, this a poignant as well as witty historical fiction where the author has successfully as well as brilliantly depicted the dark side of the war in London, where survival meant the only thing. Verdict: Historical fiction fans will love to read this one. Ten year old Noel Bostock lives in Hampstead with his godmother Mattie; an ex suffragette with strong and decided opinions. Noel is bookish, with few friends, but he is very happy with Mattie, so, when she begins to lose her memory and act oddly, his life begins to fall apart. Despite his longing for his life to remain as it is, Mattie’s illness and the encroaching war lead to Noel being evacuated to the relative safety of nearby St Alban’s. Noel dislikes his classmates and, although grateful to Ten year old Noel Bostock lives in Hampstead with his godmother Mattie; an ex suffragette with strong and decided opinions. Noel is bookish, with few friends, but he is very happy with Mattie, so, when she begins to lose her memory and act oddly, his life begins to fall apart. Despite his longing for his life to remain as it is, Mattie’s illness and the encroaching war lead to Noel being evacuated to the relative safety of nearby St Alban’s. This is an utterly joyous read. Both Vee and Noel are wonderful characters – they are both completely different and yet respond instinctively to each other’s needs. The depictions of London during wartime is both realistic and darkly humorous. The side story involving son Donald helps to give the storyline depth and I was saddened to get to the end of the novel. I have never read anything by this author before, but I certainly hope to read more. A wonderful personal read and ideal for reading groups, I recommend it highly. A tender story of survival, loss, the necessity for love, and how an unlikely pair can end up forming a powerful team. Wartime London vividly depicted. The difficulties and challenges along with the undeniable danger all halting. Very affecting allowing the reader to comprehend the lengths taken for basic survival. I adored both Vee and Noel – opposites in need of each other for varying reasons. The connection Noel shared with Mattie was compelling. I felt for his loss, it is heartbreaking. He str A tender story of survival, loss, the necessity for love, and how an unlikely pair can end up forming a powerful team. I adored both Vee and Noel – opposites in need of each other for varying reasons. The connection Noel shared with Mattie was compelling. I felt for his loss, it is heartbreaking. He struggles with grief as best as he can, the moments when he breaks down tug at your heartstrings. Vee comes across as a grifter, conniving but as her story unfolds you discover her desperation during desperate times calls for extreme measures. She’s in a difficult predicament, one I refuse to judge. Given Vee’s position during wartime not sure what I would do in order to provide for my family. Watching these two colorful quirky characters form a bond was lovely. An emotional story of human kind during a trying time when survival is a task. Bittersweet enraptured story. Isn’t it lovely when you find a story that really strikes a chord? This is the story of ten year-old Noel Bostock. He lived in Hampstead with his godmother Mattie; she had been a suffragette and she had firm and individual opinions, formed over the course of a life well lived. Noel was bright and he was bookish; he had little in common with children his own age, he didn’t understand them at all, and so he had few friends; but he was very happy with Mattie. They understood each other. But when Matt Isn’t it lovely when you find a story that really strikes a chord? But when Mattie’s mind began to fail, when she began to lose her memory and to act oddly, Noel struggled to cope. He didn’t ask for help, because he knew that Mattie wouldn’t want that. Tragedy ensued. This was the part of the story that struck a chord, because I have had to support and my own mother, who is on the same path that Mattie followed. Lissa Evans telling of this part of the story was pitch perfect and profoundly moving. Noel tried hold on to his home and his way of life, but the encroaching war, and there own wish to not be too involved, led his new guardians to send him as an evacuee, to the relative safety of nearby St Alban’s. The sullen child, who had a limp and ears that stuck out terribly, had a long wait to be offered a home; but eventually he was taken in by the muddled, well meaning, and not entirely honest Vee Sedge. Vee did her best to keep her family together. Her son worked nights and during the day often went away, offering no explanation at all; and her dependent mother, was an obsessive letter writer, writing to government ministers and public figures, determined to sort the war out and make the world a better place. The family was always in debt, it was a struggle to find the money to keep the rent collector at bay, and Vee was sure that she could keep an evacuee for less that the payment she would receive for his board and lodgings. Vee had other plans for making money from the war, and she found that a bright, young boy could be a very useful ally; Noel instinctively helped Vee and he found himself enjoying his new role. The two of them became a team. That was lovely to watch; two completely different characters, who don’t entirely understand each other but who realise they can help each other and instinctively do just that. It worked so well because those two characters were flawed and so very, very believable, and because Lissa Evans wrote of them with wit, with empathy and without a hint of sentimentality. The depictions of London during wartime was very well done, and the story touched on interesting aspects of life in wartime, some of which I hadn’t thought about before. It was utterly engaging; I was there, I was involved, I cared. I wasn’t at all surprised to find out that Donald’s absences had come about because, like his mother, he was scheming to make money from the war. His plans were much more dangerous than hers, and when Noel found himself out of his depth and in serious trouble it was Donald’s fault. Vee wanted to do the right thing, but she knew that there would be a price, and that scared her. My heart was in my mouth. The danger was very real. I was so sorry when the book was over. It spoke so very well about the lengths people will go to survive; about our need for love and support; and about how people can take you by surprise. It’s a wonderfully human story, balancing dark subjects and rich humour wonderfully well. Just recently in a review I bemoaned that a book about WWII needed to add something unique to that enormous body of literature for me to find it notable. Well, lo and behold, along comes this book to warm my heart and tickle my soul. “Crooked Heart” begins on the periphery of World War II in the outskirts of London. Noel is a 10-year-old orphan living with his beloved godmother in “a spacious brick box, with a fancy ironwood verandah and a garden full of azaleas. ‘A Victorian gentleman’s residen Just recently in a review I bemoaned that a book about WWII needed to add something unique to that enormous body of literature for me to find it notable. Well, lo and behold, along comes this book to warm my heart and tickle my soul. Noel is the child we knew in school who was indifferent to the social life of other kids because he had a life all his own, perfectly content in knowing and expanding his world of knowledge about things the rest of us never gave a single thought to. But he becomes a Dickensian child when Mattie’s mind quickly deteriorates and she wanders out at night and accidentally dies. She has refused his evacuation to the country and now Noel is placed with her cousin and his wife, so devoted to each other that there is no affection left over for Noel. Well, Noel leaves them one day to be an evacuee. All the other children in his group are fostered. And at last Vee, a dim-witted woman, takes him just for the money. But she soon realizes that this wise child with a limp could work to her advantage in the game of getting by in London circa WWII. They are sort of a Pinky and the Brain duo. But the game of getting by is not always on the up-and-up. And the London bombings do happen and the war IS a major player in their lives. And to say more of the story from here on would spoil the fun of reading the book. So just get it and read it. And hopefully you’ll find it as fresh a take on WWII as I did. Possibly my favorite read to this point in 2015. I'm so glad I read this novel Thanksgiving week, as it's been quite a while since I was emotionally invested in a book's characters enough to feel a profound gratefulness to the power of love. So many books on World War II and London's Blitz are sentimental and tired, but Lissa Evans's is beautifully moving because the war is second to the desperate characters. Parts of the book are funny, while other parts provoke anxiety on behalf of a little boy named Noel who is preternaturally intelligent a I'm so glad I read this novel Thanksgiving week, as it's been quite a while since I was emotionally invested in a book's characters enough to feel a profound gratefulness to the power of love. So many books on World War II and London's Blitz are sentimental and tired, but Lissa Evans's is beautifully moving because the war is second to the desperate characters. Parts of the book are funny, while other parts provoke anxiety on behalf of a little boy named Noel who is preternaturally intelligent and sadly abandoned. Much of my pleasure was derived from the superb writing, writing that evokes perfectly resonant images and an English way of life particular to the period. When Noel runs out of books to read the time "stretched like knicker elastic," or when "the bombing stopped in May, it took weeks for them to lose the habit of nightly fear, to straighten up, like grass after the roller has been shifted." As the Second World War breaks out, ten-year-old Noel Bostock lives in London with his adored godmother and guardian Mattie, an ex-suffragette with an entertainingly formidable personality and unconventi When I finished reading Crooked Heart by Lissa Evans, my first thought was that it reminded me of a cross between Cold Comfort Farm, I Capture The Castle and Goodnight Mr Tom. Those aren't comparisons I would ever make lightly - in fact, it's about as strong an endorsement you could get from me. Crooked Heart joins The Book Thief and The Lion, The Witch, and the Wardrobe as books whose protagonists are youthful evacuees during WWII trying to find where they fit in with a new "family." Crooked Heart, however, lacks both the charming characters of The Book Thief and the adventure-filled plot of The Lion, The Witch, and the Wardrobe. Noel is already adrift without family ties, when he lands on the doorstep of Vera (Vee) Sedge, a woman with a full house but an empty life. Vee cares for both Crooked Heart joins The Book Thief and The Lion, The Witch, and the Wardrobe as books whose protagonists are youthful evacuees during WWII trying to find where they fit in with a new "family." Crooked Heart, however, lacks both the charming characters of The Book Thief and the adventure-filled plot of The Lion, The Witch, and the Wardrobe. Noel is already adrift without family ties, when he lands on the doorstep of Vera (Vee) Sedge, a woman with a full house but an empty life. Vee cares for both her mother, a mute who spends her days tethered to the wireless, and her adult son, who can't seem to keep a legitimate job to contribute to the family's welfare. Enter Noel, a precocious and gifted 10-year-old, still grieving the loss of his godmother, Mattie. It is obvious that Noel and Vee's lives are destined to become intertwined, though the route the author takes is neither direct nor engaging. The problem for me lies in the characters. Noel initially refuses to talk, Vee's mother can't talk, and her son is never around to talk. The characters carry on in their own orbits, sometimes not even circling the same planet. Other books that employ multiple perspectives and parallel narratives draw you in with well-developed characters, each with his/her own internal struggles and moral dilemmas. Not so in this case. We know so little about Vee's mother and son that we can neither empathize with nor understand their erratic behavior. They show no concern others, and I really felt no concern for them. They each had their own story arc, but honestly, the book would have been just as good (or bad) without them. The plot was not much better. There was no overarching conflict-neither internal nor external. Noel and Vee employ a con to earn money, but soon abandon it. Noel decides to right a wrong, but that too falls flat. Despite not having any compelling rising action, I did stick it out and found the book to have a satisfying ending, but only in the sense that everyone found themselves settled somewhere at the conclusion. Final notes: The book wasn't terrible. Perhaps I have been overly harsh with this review, but there are SO many better books out there, especially in this genre. If you are looking for a coming-of-age, World War II, historical fiction book, let me know. I will come up with a top ten list, but it won't include Crooked Heart. I appreciate the theme of this book. Who benefits from war and can benefiting from war be moral? Most people would first think about major war profiteers; for instance, large companies that make and supply arms, tanks, planes, anything used for fighting. Not Evans. She writes about the minor war profiteers, the small time swindlers trying to make a bit of extra cash. This is an interesting idea but the execution of it in this book just didn't work for me. The characters were well-drawn but they I appreciate the theme of this book. Who benefits from war and can benefiting from war be moral? Most people would first think about major war profiteers; for instance, large companies that make and supply arms, tanks, planes, anything used for fighting. Not Evans. She writes about the minor war profiteers, the small time swindlers trying to make a bit of extra cash. This is an interesting idea but the execution of it in this book just didn't work for me. The characters were well-drawn but they were all a bit too silly for me. This is my experience watching British comedy shows from Monte Python to Absolutely Fabulous. Everyone in the room with me is laughing except for me. This is sort of like my experience reading Crooked Heart after reading so many positive GR reviews. Everyone else loved this book but I just couldn't appreciate it. I didn't laugh when I knew I was supposed to laugh, I wasn't charmed when I was supposed to be charmed. Perhaps the cold Colorado winter has frozen my heart. Crooked Heart was well written, witty and endearing. Noel, the orphan-boy in the story, was compellingly strange and unique. Vera, the money-grubbing, bottom of the barrel scraping, system manipulating thief some how makes you root for her. Perhaps it's because her schemes are hilarious failures. Or maybe it's just because of her heart, and it's surprising enormity. The two of them make for quite the team, needless to say. So, why the 3 star rating? As much as I enjoyed the characters in this no Crooked Heart was well written, witty and endearing. Noel, the orphan-boy in the story, was compellingly strange and unique. Vera, the money-grubbing, bottom of the barrel scraping, system manipulating thief some how makes you root for her. Perhaps it's because her schemes are hilarious failures. Or maybe it's just because of her heart, and it's surprising enormity. The two of them make for quite the team, needless to say. Noel is a lonely, rather odd little boy evacuated out of London during World War II and Vee is the anxious, frazzled woman who takes him into her home. Their friendship doesn't begin well; it reminded me of this from Something Fresh by P.G. Wodehouse, "Each, in fact, was to the other a perpetual freak show, with no charge for admission." Eventually, after Noel proves to be a great help to Vee, things begin to change; "She was used to his conversation now, the long words, the oddity and arrogance Noel is a lonely, rather odd little boy evacuated out of London during World War II and Vee is the anxious, frazzled woman who takes him into her home. Their friendship doesn't begin well; it reminded me of this from Something Fresh by P.G. Wodehouse, "Each, in fact, was to the other a perpetual freak show, with no charge for admission." Eventually, after Noel proves to be a great help to Vee, things begin to change; "She was used to his conversation now, the long words, the oddity and arrogance; half the time she didn’t know whether to clout him or applaud." As surprising as this sounds, this was a heartwarming tale. I know WWII Historical doesn’t immediately bring up thoughts of humor and a smile on your face as you finish reading, but Crooked Hearts did that. This very unlikely duo has stolen my heart. Ten year old Noel is being evacuated to a safe place. Due to bomb threats a lack of shelters, like many children, he is taken from the comfort of his home and placed with a foster family in a safe location. Except, Noel didn’t really have a comfortab As surprising as this sounds, this was a heartwarming tale. I know WWII Historical doesn’t immediately bring up thoughts of humor and a smile on your face as you finish reading, but Crooked Hearts did that. This very unlikely duo has stolen my heart. Ten year old Noel is being evacuated to a safe place. Due to bomb threats a lack of shelters, like many children, he is taken from the comfort of his home and placed with a foster family in a safe location. Except, Noel didn’t really have a comfortable home. Noel’s Godmother has just passed and the almost next-of-kin had no interest in another mouth to feed. Enter Vera, a woman with enough problems of her own. Widowed years ago she is now the sole caretaker to her mute mother and she is the mother of Donald, a listless man with no direction in life. When Noel witnesses a scheme Vera thought up to try to make money, Noel enlists himself to help her. Although they had nothing in common, their journey will lead them to common ground and a safety they create for themselves. I fell in love with Noel. Noel is a witty, charismatic boy with uncanny intelligence. The wisdom lent him by his godmother before she past has left him with a problem solving nature. He uses his first encounters with strangers to observe without interruption. This leaves people to think he may be slow or something. Noel is anything but slow! Vera, or Vee, is a bit hard to take at first. Once I learned her story it made sense that she would not welcome a strange child into her world. The two of them together is really magic. We get to learn a lot about Donald in this story as well. By venturing into places he shouldn’t, Donald gets himself into a whole mess of trouble. This was such a well written historical novel. Told entirely in 3rd person, I got a good look into the lives of these people. The places are described beautifully, not that they are exactly beautiful, but I got a real feel for the locations. Also, the language and customs were right on point. This story takes place in England during WWII, so the slang required me paying close attention. It might be a bit difficult for readers who, like me, aren’t used to it. Also, there were a few gaps in the story but mostly when we were focused on Vee, who was the type of person to just take someone at their word. Oh, I'm telling you right up front that Crooked Heart by Lissa Evans is going to be one of my top reads for 2015! It's the height of WWII and England is on high alert. Ten year old orphan Neil Bostock is evacuated from London. He lands with Vee - a small time con artist with a good heart, but not great luck. Neil is educated, precocious and misses his suffragette Godmother Mattie terribly. Neil and Vee seem like an unlikely pairing. But 'war makes strange bedfellows.' And they might just have wha Oh, I'm telling you right up front that Crooked Heart by Lissa Evans is going to be one of my top reads for 2015! Evans has created such tangible characters in Vee and Noel. My opinion of Vee changed as the book progressed - from dismissing her as a hustler, to getting to know her, to empathizing with her losses, and finally to cheering her on, hoping against hope that the ending I want would materialize. We get to know Noel slowly as he assesses his current situation and adapts as need be. I was immediately taken by him. Other supporting characters are just as interesting - I especially enjoyed the myriad letters that Vee's mute mother pens. Mattie makes only a brief appearance, but her presence is large in Noel's life and memories and we come to love her as much as he does. The wartime setting is also a character in Crooked Heart. The rationing, the attitudes, the bombings and more all shape, direct and change the course of Vee and Noel. Now, yes, there are sad situations, but.....Evans has a wickedly dark sense of humour that's quite appealing. Her sly wit is visible in a description, a look or a snippet of dialogue. Above all, Crooked Heart is entertaining. I read so many books and often find I can predict where a tale will go, or recognize a plot. I truly had no idea where Evans was going to take her tale. Initially, I took the moral high ground when confronted with Vee's scams. But, my opinion rapidly changed as I got to know Vee and Noel. I found myself soundly in their corner - and hoping they could scam the scammers. Evans nicely explores right and wrong through many characters and situations in Crooked Heart. And by the end, it's impossible to say that a little bit of wrong isn't a little bit right. Every so often a book comes along that makes you want to thrust it into people's hands and say "read this - it's wonderful". Crooked Heart by Lissa Evans was published by Doubleday (Transworld) on 6 November for Kindle and in hardback. As a quick look at the Amazon page will tell you, it's already gathered a large number of impressive comments from people who certainly know about these things. Such praise sometimes worries me, and books sometimes just don't live up to expectations - but this one Every so often a book comes along that makes you want to thrust it into people's hands and say "read this - it's wonderful". Crooked Heart by Lissa Evans was published by Doubleday (Transworld) on 6 November for Kindle and in hardback. As a quick look at the Amazon page will tell you, it's already gathered a large number of impressive comments from people who certainly know about these things. Such praise sometimes worries me, and books sometimes just don't live up to expectations - but this one exceeded every expectation I had. The characters are simply perfect. Not just brittle and hard-edged Vee who later reveals a heart of pure gold, and poor awkward Noel, old way beyond his years and wanted by no-one, with his sticking-out ears and difficult ways. They are a magnificent pairing, with a story that will grab you and never let you go until you turn the last page, but the supporting characters are every bit as engaging. There's Vee's mother, who lost her power of speech when Vee's son was born but writes wonderful letters to everyone from Winston Churchill to Arthur Askey about the realities of living through the war. Then there's Vee's son Donald, whose dodgy heart has helped him to avoid the draft, and now has a use for others. Noel's godmother Mattie, the former suffragette with an unusual slant in her view of life, who appears only in the prologue and in Noel's memories, is a superb creation. There's a vast cast here, every individual perfectly drawn, all leaping off the page - I've rarely read a story where the writer does such a good job of breathing life into characters who may only appear on the page for a very short time. The wartime setting is vividly and authentically created, full of domestic detail, unflinching in the way it portrays the human impact, and the human cruelty and nastiness that lurks beneath the "all pulling together" surface. The book is very, very funny at times - but it also succeeds in being desperately and heart-breakingly moving, with a story you'll never forget. I unreservedly loved it - without question one of my books of the year. My thanks to netgalley and publishers Transworld for my advance reading e-copy. Noel is a very smart boy who is living in London with his godmother. When she becomes more and more forgetful Noel has to shoulder many responsibilities at a very young age. The German's are bombing London and it looks like the Second World War is going to take a while, so all the children need to be evacuated. At first Noel manages to stay, but then the inevitable happens to his godmother and he has to live somewhere else. His new carers think he will be safer elsewhere. He ends up with Vee, a Noel is a very smart boy who is living in London with his godmother. When she becomes more and more forgetful Noel has to shoulder many responsibilities at a very young age. The German's are bombing London and it looks like the Second World War is going to take a while, so all the children need to be evacuated. At first Noel manages to stay, but then the inevitable happens to his godmother and he has to live somewhere else. His new carers think he will be safer elsewhere. He ends up with Vee, a woman who doesn't have a plan and who is all over the place. She's living with her mother and her useless son. Noel and Vee are very different. He's so smart that he has nothing in common with his classmates and he has a posh accent while Vee hasn't had much schooling and can barely write. When Vee is short of money she needs to think of something which isn't going very well. Until Noel helps her out. Together they are quite a good team. Noel has been evacuated, but that doesn't mean he's safe and secure at all. Will he and Vee manage to find their way together or will his life be an even bigger disaster than it already was? "Crooked Heart" is a dark comedy that could have been more aptly titled "Paper Moon Over England". Vera is a single mother to a layabout adult son and Noel is an orphaned evacuee from London during the Blitz. As individuals they are pretty hopeless, but they make a good team when it comes to running a charity scam. It seems everyone in Great Britain is running some sort of con in this novel and it can get a bit dangerous when one scheme runs afoul of another. When orphaned Noel, a sensitive boy of 10, is evacuated outside London, the only home he is offered is with Vee, a down-on-her luck woman who seeks to make a living through any questionable scheme imaginable. . . This was my first novel by Lissa Evans – but it certainly won’t be my last. I recently saw the film Their Finest – (which I loved) but only learned later that it was adapted from a novel by Lissa Evans, who I have followed on social media for a couple of years. The characterisation in Crooked Heart, is just superb – and it occurred to me while reading how visual this novel is (if that makes sense). The author quite obviously binging her experience of working in film and television to her writing. This was my first novel by Lissa Evans – but it certainly won’t be my last. I recently saw the film Their Finest – (which I loved) but only learned later that it was adapted from a novel by Lissa Evans, who I have followed on social media for a couple of years. The characterisation in Crooked Heart, is just superb – and it occurred to me while reading how visual this novel is (if that makes sense). The author quite obviously binging her experience of working in film and television to her writing. Noel Bostock is an extraordinary young boy, just ten years old, intelligent and resourceful. He has a slight disability picked up from polio, which leads some people to under estimate him. A voracious reader of detective novels – in time we see he has been picking up tips. An orphan, as the second world war breaks out, he is living with his godmother Mattie. Mattie is a fabulous character, a former suffragette – her medals are prized possessions and she is full of stories. Mattie’s way of raising a child is perhaps unconventional. She speaks to Noel like an adult, bringing him up to have an understanding of the world around him and to disapprove of the war. Mattie is reluctant to obey the blackout rules and other government directives, and when the forms arrive to apply for ration books, it is Noel who fills them in. His upbringing means that Noel is more comfortable around adults – though he detests Mattie’s relatives who come to call from time to time. He is not used to other children. A completely captivating and utterly charming read. Set amidst the uncertainty and struggle of world war 2 it tells the story of young orphan, Noel an unprepossessing lad who has few friends, sticking out ears and a love of books and an extensive vocabulary which can make him come across as pompous. Noel has spent his formative years being brought up by his revered Aunt Mattie an opinionated ex suffragette. Watching her slide into senile dementia is a step too far for Noel and he becomes even mor A completely captivating and utterly charming read. Set amidst the uncertainty and struggle of world war 2 it tells the story of young orphan, Noel an unprepossessing lad who has few friends, sticking out ears and a love of books and an extensive vocabulary which can make him come across as pompous. Noel has spent his formative years being brought up by his revered Aunt Mattie an opinionated ex suffragette. Watching her slide into senile dementia is a step too far for Noel and he becomes even more insular, meaning that when he is evacuated from London, he is one of the least likely youngsters to be placed in a warm and caring home. He ends up being billeted with the disorganised and brash Vee who always has an eye for making a penny or two (not always strictly above board) and her willingness to accept Noel into her home initially stems from an idea for a money making scam. In this none too homely billet live Vees, mother, with selective mutism who spends her days writing lengthy letters to people in power criticising the war efforts, and including irrelevant facts about her life. Also her son Donald, thoroughly unlikeable, but the apple doesn't fall far from the tree and he too has his eye on the main chance - to profiteer from the war. Vee and Noel thrwon together form a formidable duo and when they combine efforts they begin to have a grudging respect for one another. I like Vee, I thought she had a hard life and was making the best of things. The wartime descriptions seemes accurate and very atmospheric, I really felt as though I was there in the public air raid shelters and creeping about in the blackout with my barely there torch. I shed a little tear towards the end and for me, even though its a quick read it had something of The Book Thief the Book thief about it, I've also seen it compared to Good Night, Mr. Tom Goodnight Mr Tom and I agree if you enjoyed that book you'll probably love this also - I did and will be looking for more books by this, hitherto unknown to me, author. N There are lots of recently published books that are set during World War II, it would be easy to say that the subject has been done to death, and then, just when you don't expect it, you come across a story like Crooked Heart. This is a story that will pull the heartstrings with it's central character of Noel and his temporary mother Vera. Two characters who are original, and quirky and completely fabulous creations. Their story is like no other, it's charming and witty and will make you smile. I just wrote a really carefully developed rave review of this wonderful book and then the computer burped and it disappeared. I am very sad. However, it is a rare and lovely book: controlled, wry, funny, heart-breaking, and insightful. It's beautifully written--even the cover is gorgeous!--and I want to go buy myself a copy to keep. Evans manages to take us into Vee's and Noel's worlds, and she creates unprepossessing characters who eventually win our hearts. I plan to read her other books, too! I just wrote a really carefully developed rave review of this wonderful book and then the computer burped and it disappeared. I am very sad. However, it is a rare and lovely book: controlled, wry, funny, heart-breaking, and insightful. It's beautifully written--even the cover is gorgeous!--and I want to go buy myself a copy to keep. Evans manages to take us into Vee's and Noel's worlds, and she creates unprepossessing characters who eventually win our hearts. I plan to read her other books, too! Two great passages are on page 200 (about Vee's lazy son) and page 243 (where Vee reassures Noel about his guilt). . . but I haven't the heart to type them out again. Every page a feast of comedic characters and situations. Though flawed, each character makes you want to root for them and their schemes. Noel, Vee, & Don. Mattie and Mrs. Gifford. They are endeared to me. Some might say the ending is too neat, too easy. But note to self: do not try to put a realistic sensible ending onto a hilarious plot. Just enjoy the ride. Oh, along the way, learn some things you have never thought of before, about WWII. Topnotch. Bravo. Thank you Lissa What a delight to read.